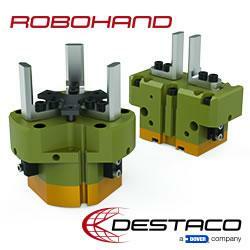 OCTOPUZ will be at FABTECH Canada from June 12th to 14th. Taking place at the Toronto Congress Center, Toronto, ON. FABTECH is the largest fabricating, welding, metal forming, and finishing event in Canada. 06/11/18, 05:30 AM | Industrial Robotics, Factory Automation | ABB Inc.
ABB introduces its new innovative digital technology at ACHEMA, offering process industries lower costs, reduced risks and improved schedule along with the ability to adapt to changing consumer demands. 06/07/18, 07:52 AM | Industrial Robotics, Factory Automation | Dorner Mfg. Corp.
To illustrate its capabilities, Trelleborg Sealing Solutions is launching a video and augmented reality brochure. Mouser Electronics announces the release of a new e-book titled Collaborative Robotics, the most recent offering in the Generation Robot series, part of Mousers Empowering Innovation Together program. The Sales Leadership Award is presented to integrators who purchase and integrate at least 25 robot units during the year.